In two races this year, the Telenet Fidea Lions have come away with two wins. 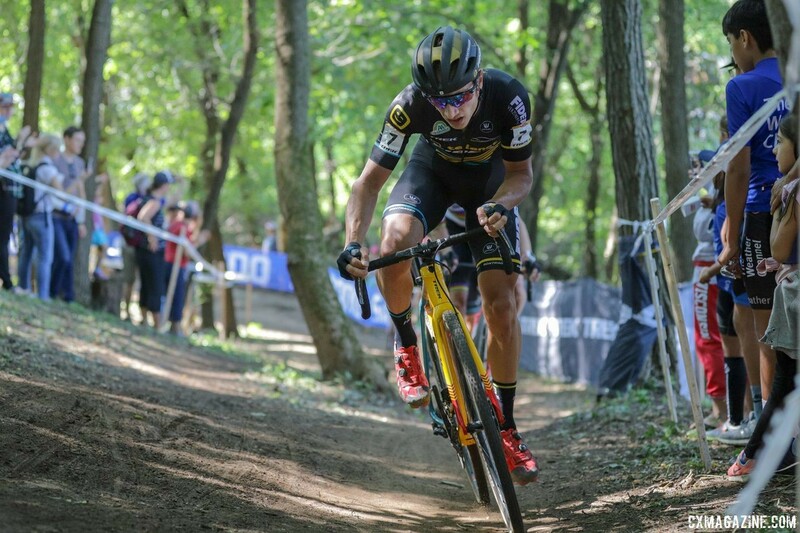 After Sunday’s World Cup Waterloo at the Trek Factory in Wisconsin, it is now three of three for the Trek-sponsored cyclocross team. One of the big wild cards coming into Sunday’s race was how Wout van Aert (Unattached) would race given the busy week where he found himself without a team and sponsors. 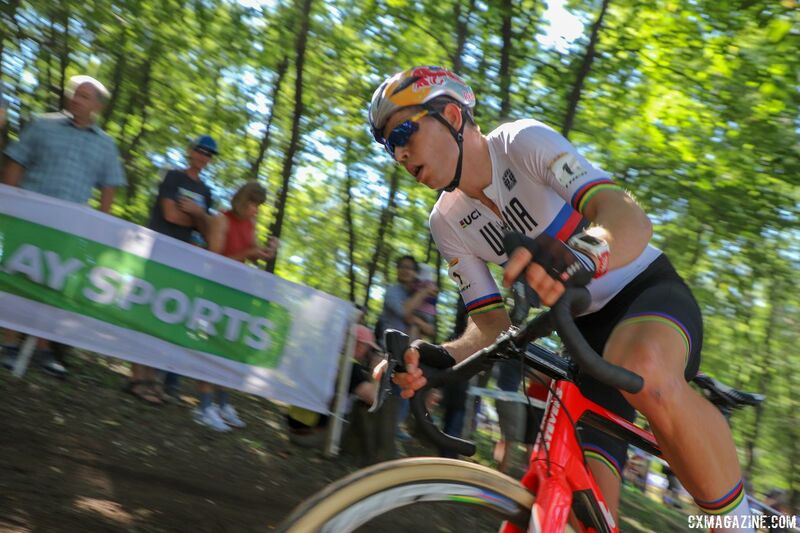 Early in the race, Van Aert showed no effect of the stress he has faced recently as he helped drive the pace in the lead group early in the race. After four laps, a lead group of seven was whittled to four thanks to an attack by Toon Aerts (Telenet Fidea Lions). A lap later, a washout by Daan Soete (Pauwels Sauzen – Vastgoedservice) took out Quinten Hermans (Telenet Fidea Lions), and the lead group was now down to just Van Aert and Aerts. 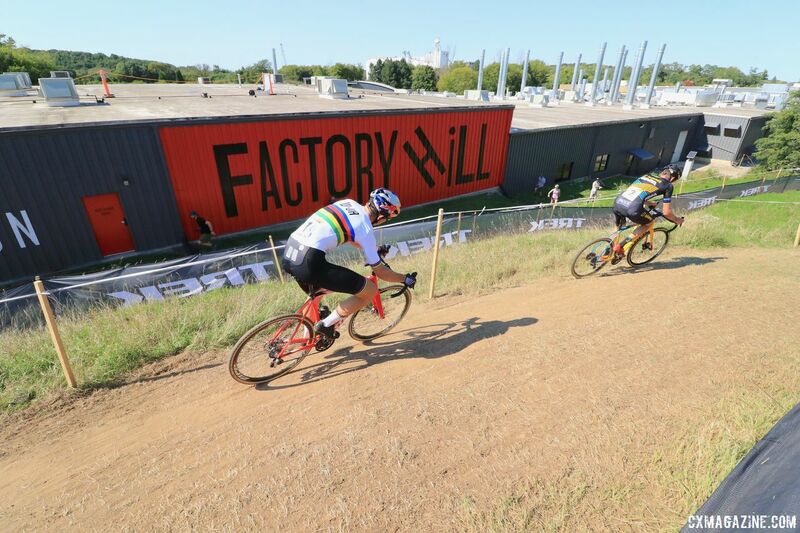 Late in Lap 6 of 9, Aerts put in an effort after cresting Trek Factory Hill. He pressed his advantage and unleashed a powerful attack up the hill leading to the barn flyover. Van Aert had no response for Aerts’ aggression. The Lion was not challenged for the rest of the race, and he took home the first Elite World Cup win of his career. 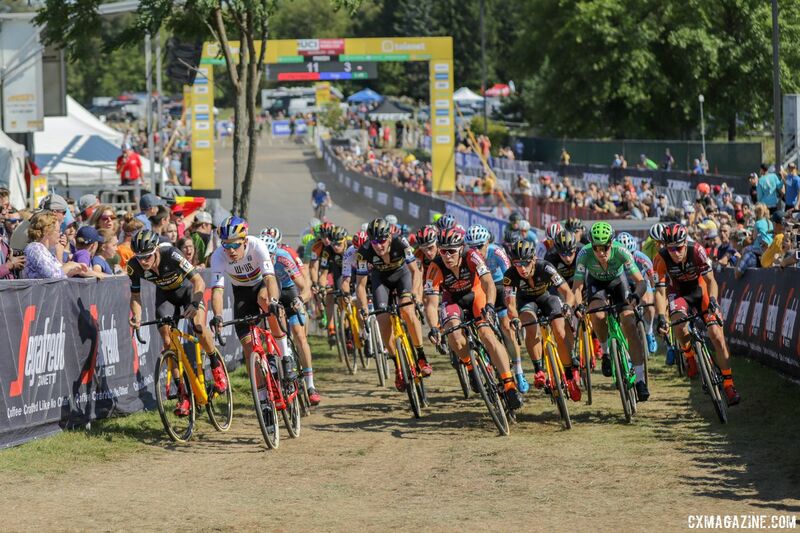 From the whistle, Wout van Aert showed he was ready to put the last week behind him by taking the holeshot and leading the race early on. Laurens Sweeck (Pauwels Sauzen – Vastgoedservice) next took over lead duties as a large group strung out at the front. There would be no wire-to-wire win in Waterloo in 2018. Early in the first lap, Lars van der Haar (Telenet Fidea Lions) crashed on an off-camber and took Stephen Hyde down with him. Hyde tried to keep racing but withdrew due to a shoulder injury suffered in the crash. Two laps in, the lead group fluctuated and then settled in at seven riders: Van Aert, Aerts, Sweeck, Soete and Hermans, Corne van Kessel (Telenet Fidea Lions) and Eli Iserbyt (Marlux-Bingoal). In the fourth of nine laps, the group started to shrink. Sweeck made a mistake hopping the barriers, and he dropped off the fast pace at the front. Aerts then attacked at the end of the lap, and the group dropped to just Aerts, Van Aert, Soete and Hermans. Two straight beautiful Wisconsin fall days on Saturday and Sunday helped dry out the course at Waterloo, and many of the corners started to get a little dusty after a weekend of professional and amateur racing on the track. 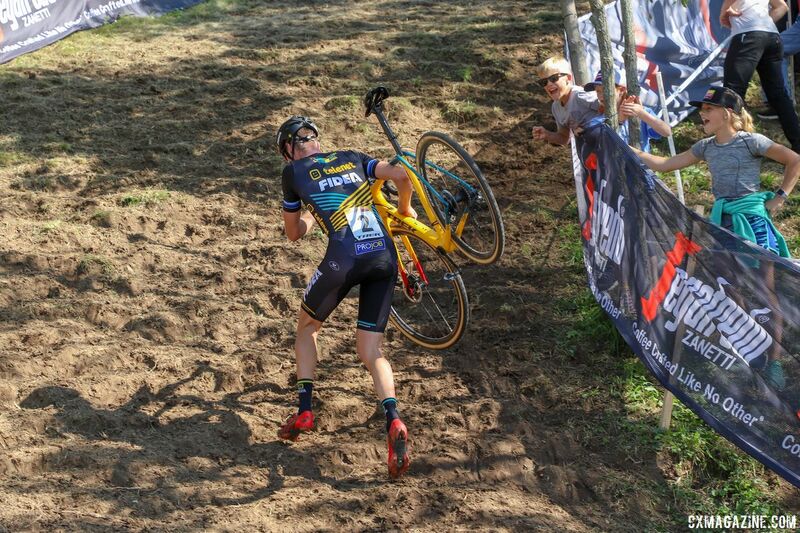 Soete fell victim to one of the dusty corners when he washed out early in Lap 5. His mistake also took out Hermans, who was right on his wheel. 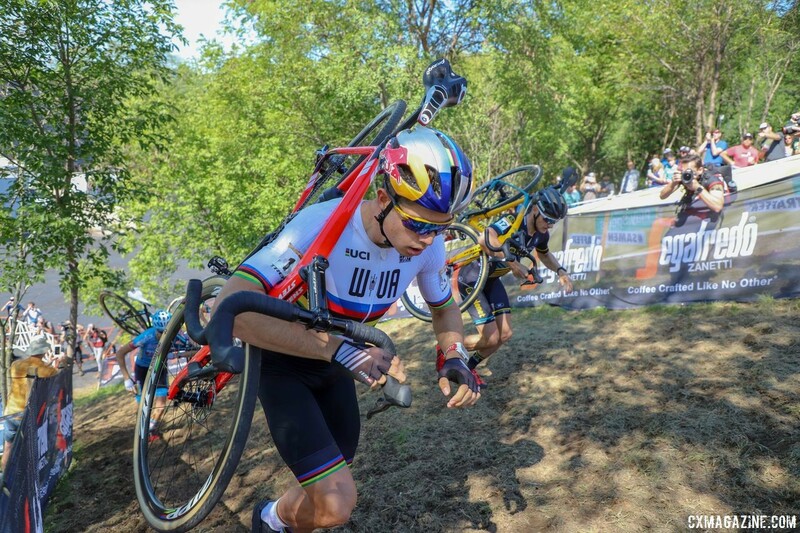 It was now down to just Van Aert and Aerts for the World Cup Waterloo win. 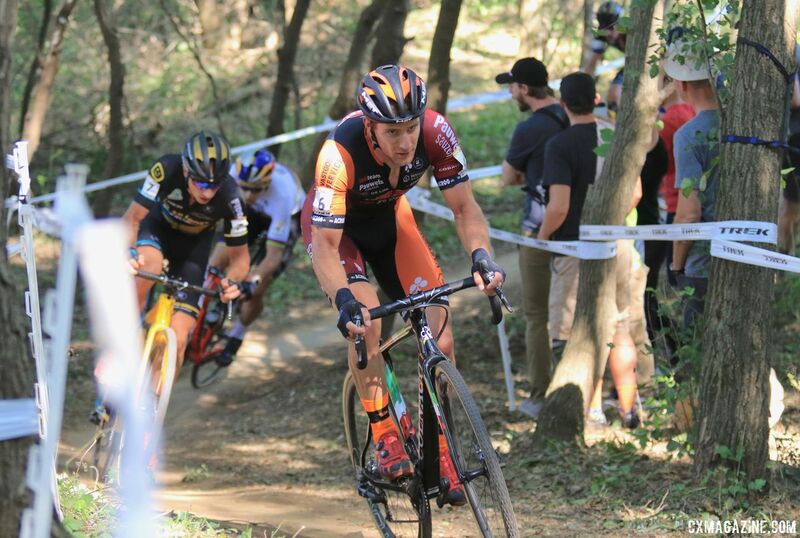 Aerts knows success at the Trek course after his second-place finish in the C2 last year. 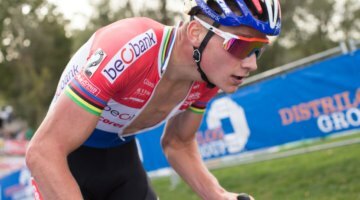 That race, he was unable to keep pace with Mathieu van der Poel. This year, he found himself facing off against the three-time world champion Van Aert. Aerts attacked after Soete and Hermans went down, and the two Belgians held together for the next lap. Towards the end of Lap 6, Aerts started to press Van Aert beginning with the trip down and up Trek Factory Hill. 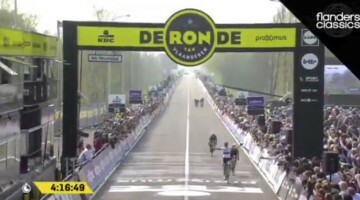 When the two crossed the finish, Aerts had a lead of about 20 meters on Van Aert. With his opponent flagging on the warm afternoon, Aerts went all-in. Aerts got up out of the saddle and unleashed a massive attack up the incline leading to the barn flyover. Van Aert could not follow his move, and a few meters quickly became a several-second lead. When Aerts crossed the line for two to go, his efforts had given him an 11-second advantage. 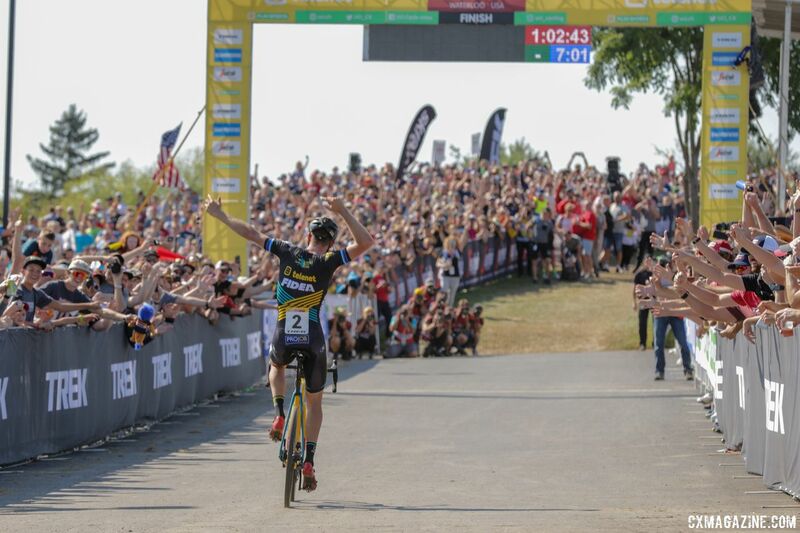 While the race announcers were remembering Van Aert’s big comeback at CrossVegas in 2016, the champ would have no magic on this September afternoon in Waterloo. 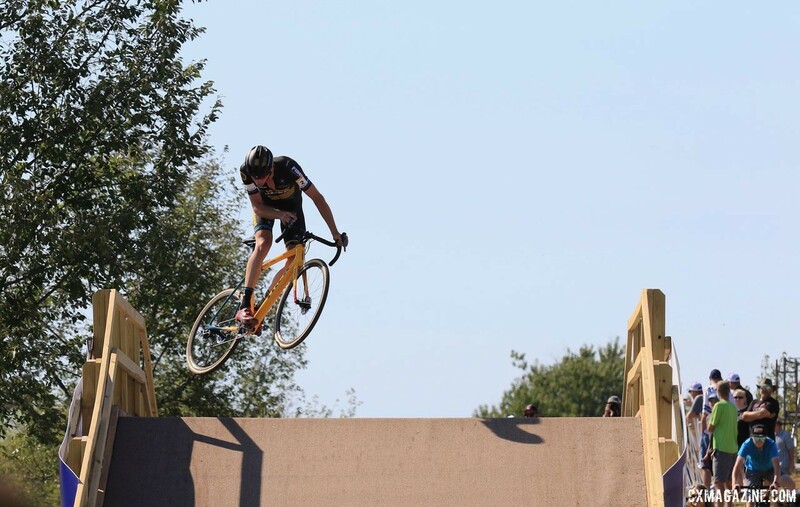 Aerts kept his lead for the last two laps and celebrated his last few hundred meters with a tailwhip off one of the new flyovers Trek built for the race. 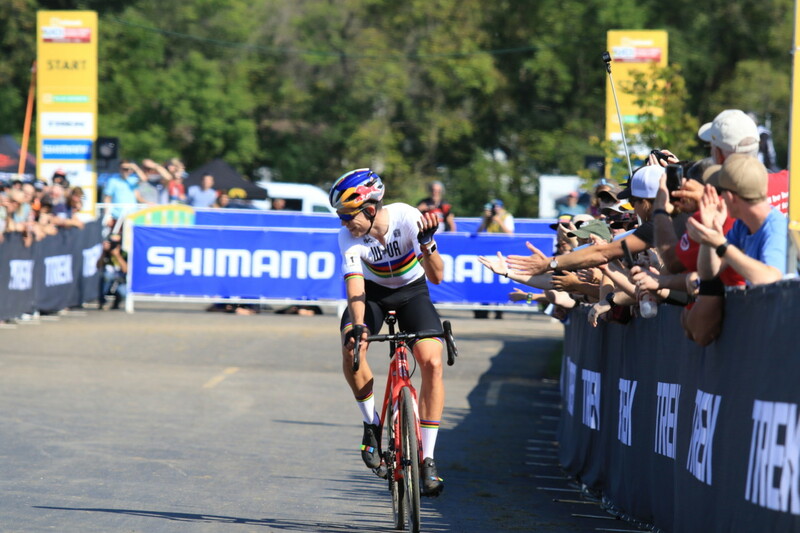 Van Aert finished second, and then quickly turned his thoughts towards next weekend’s World Cup at Jingle Cross. The battle for third also resolved itself in Laps 5 and 6. After Soete’s crash, Sweeck, Van Kessel and Iserbyt passed the duo near the barriers. Sweeck quickly took charge of the chase and staked out solo after Aerts and Van Aert. 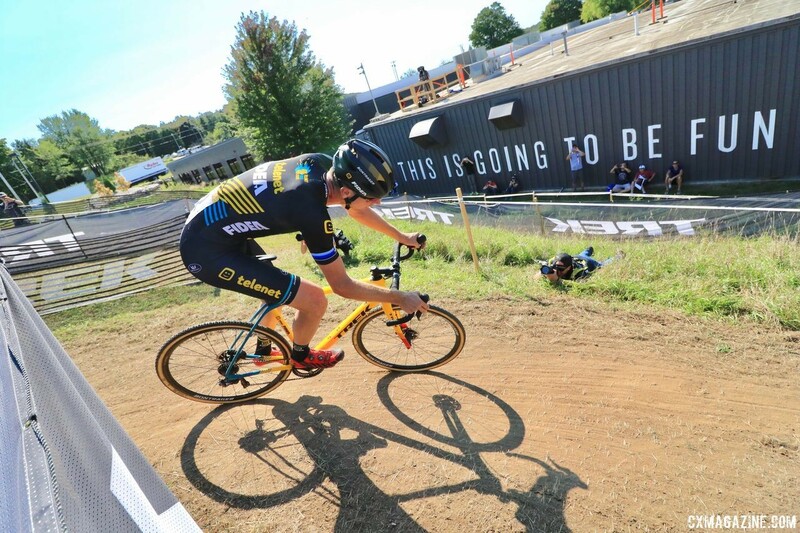 Sweeck held the third spot to take home a podium finish from Waterloo. 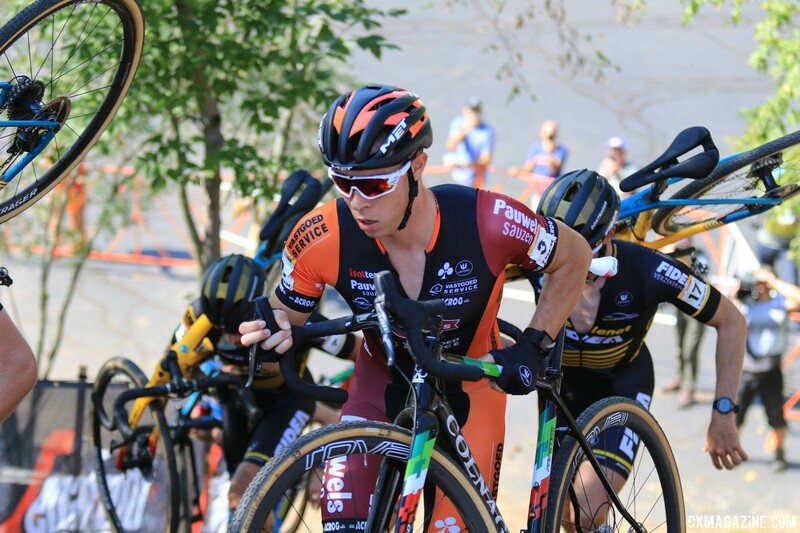 Kerry Werner (Kona Maxxis Shimano) finished 22nd, Curtis White (Cannondale p/b CyclocrossWorld) took 23rd and Cody Kaiser (LangeTwins / Specialized) finished 25th to lead the 16-rider American contingent. 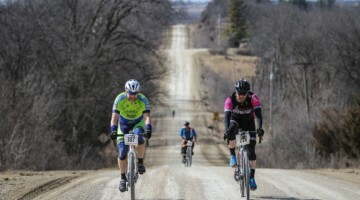 Full results and a photo gallery are below.